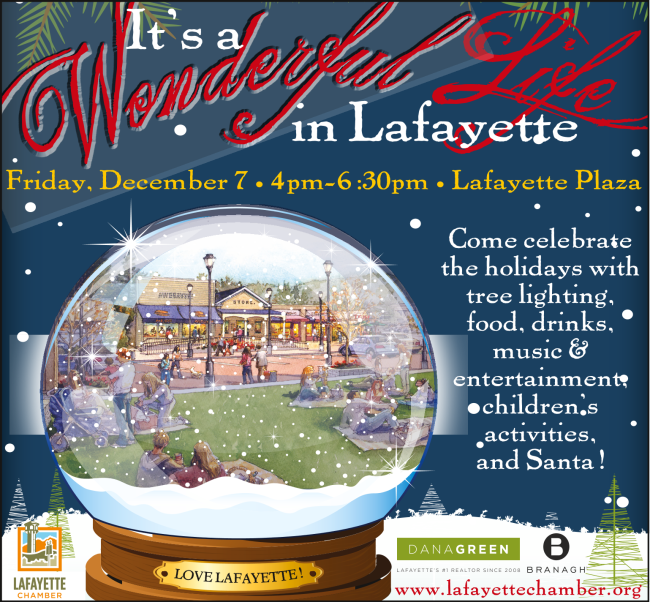 It's a Wonderful Life in Lafayette...Join us Friday! 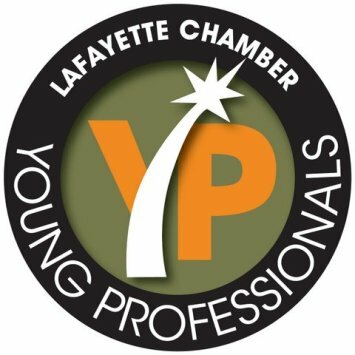 Meet other like minded young professionals for a fun holiday mixer at a restaurant with an amazing atmosphere and excellent staff. Friends and coworkers are welcome. We look forward to meeting you there! $15 includes one drink and apps. Learn more here. sewnow! 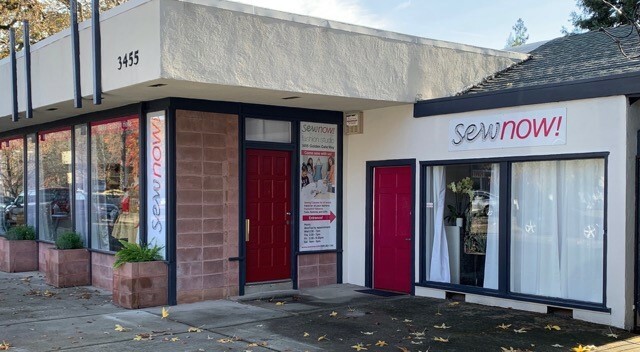 is excited to announce they have re-located to a fabulous new light filled studio at 3455 Golden Gate Way just a block and a half from their former space. Come see the new set-up and all of the creativity that is brewing there and celebrate both their new location and their 12th anniversary in business in Lafayette. Learn more here. Join us for this free, fun, family-friendly celebration – tree lighting, live music, community sing-a-long, kid's crafts, photo ops and more! Santa parades along Golden Gate Way arriving at Lafayette Plaza Park at 4:30pm. Bring a canned food donation for the Food Bank of Contra Costa and Solano. 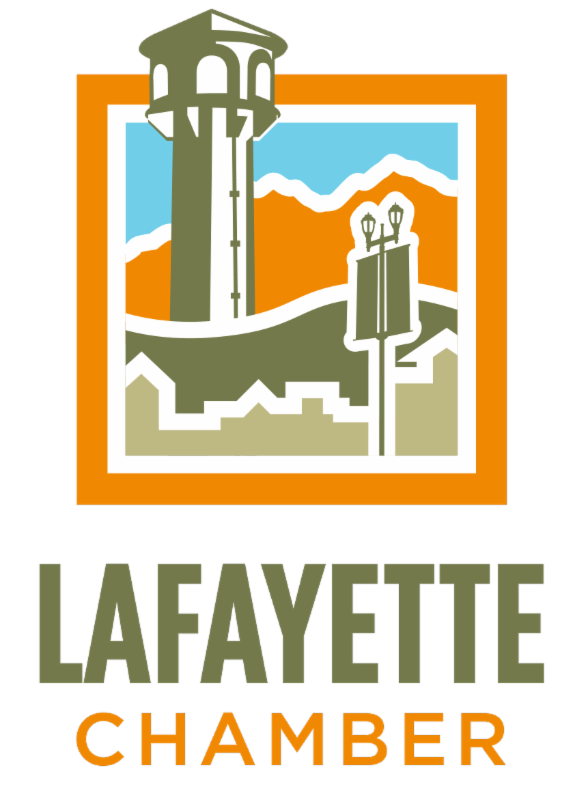 Presented by the Lafayette Chamber. Sponsored by The Dana Green Team and Branagh Development. Learn more here. 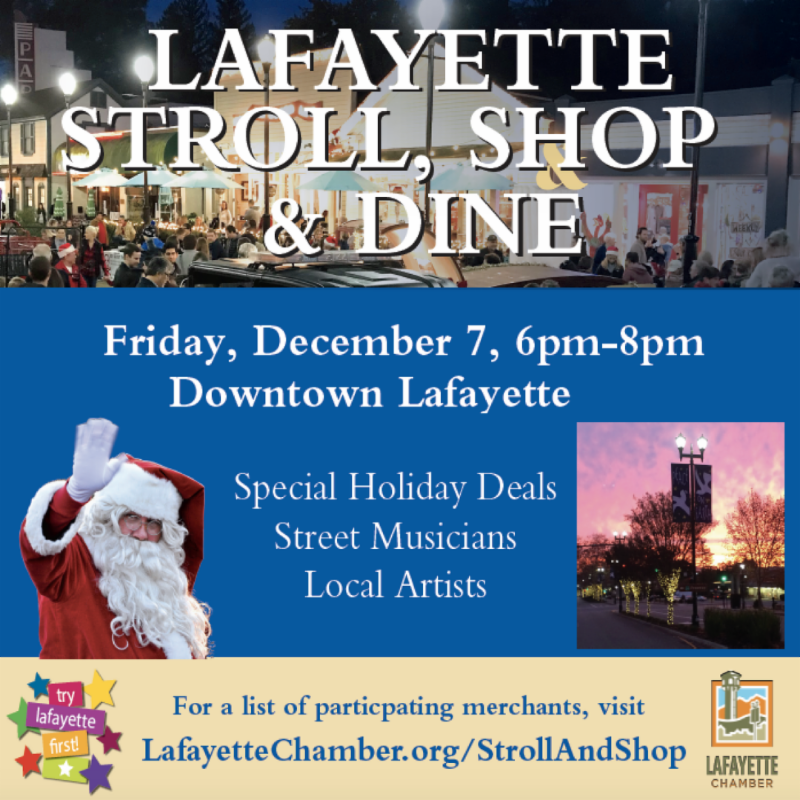 And NEW this year ... Lafayette Stroll, Shop & Dine! We are excited to announce that we have extended our annual “It’s a Wonderful Life” Holiday event on Friday, December 7 by including a stroll down Mt. Diablo Blvd. from 6:00pm-8:00pm. Start your Holiday shopping by visiting our local businesses and take advantage of their special pricing. Restaurants are also joining in on the fun! Artist booths and musicians round out the evening. You may even run into Santa and Mrs. Claus! Canned food donations are being collected for the Food Bank of Contra Costa and Solano. Bring your friends to enjoy the Holiday experience! Learn more here. If you are a local business or restaurant and would like to participate in this event, please contact the Chamber TODAY at (925) 284-7404 and we will put you on the list that will be distributed at the “It’s a Wonderful Life” Holiday event as well as being listed on our website. Learn more here. Saturday, December 8, 9am, 3597 Mt. Diablo Blvd. 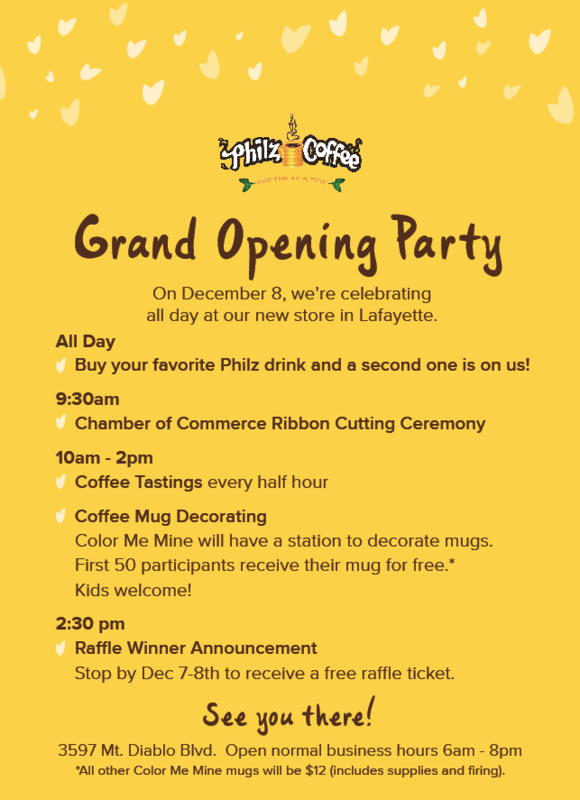 Join us for a ribbon cutting at their new Lafayette location! Philz Coffee will have special promotions througout the day and a raffle. The ribbon cutting will be at 9:30am but we encourage you to come at 9am. See their invite for all the Grand Opening Party details! 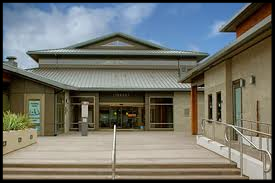 Wednesday, December 12, 5:30pm-7:30pm, Lafayette Library and Learning Center , 3491 Mt. Diablo Blvd. It's our favorite mixer of the year! Please join us for this special event. Bring a canned food donation of three cans and admission is free! Chamber members, $10, non chamber members $20. Cash only at the door please. Many thanks to our local restaurants (confirmed to date) for providing our delicious evening bites: Amarin Thai, Batch & Brine, Great Wall, Hideout, Lafayette Park Hotel & Spa, Patxi's Pizza, Pizza Antica, Philz Coffee, and Uncle U's. Bring your business cards! Learn more here. Start your business off on the right foot for 2019 success with this step by step workshop! We'll show you how to claim and keep your Google Local Business Profile optimized! A must for any local business with a brick and mortar location and/or a defined local service area. Speaker: Robin S Fox, Digital Strategist & Online Community Manager. Register here. Welcome one of Lafayette's newest businesses! Join us for a Ribbon Cutting at RnR Barbers, 3557 Mt. Diablo Blvd, and see what all they have to offer! Save the date for this exciting tech talk by Michael Hayes. More info coming soon! Save the date for our Business Person of the Year Dinner. Awardee will be announced in the next few weeks. At that time tickets will go on sale for the dinner on the Chamber's website. SEED, Lafayette’s special education foundation, is looking for local businesses who are interested in sponsoring our new series of Spectacular Special Needs Parties at the Lamorinda All-Access Playground at Moraga Commons. The first party will be held on Saturday, Dec. 8th from 2-4 p.m. Since many special needs kids miss out on birthday parties, these fun events will give them a birthday party experience complete with cake, snacks and entertainment. Children who have had a recent birthday can pick out a prize from the treasure chest. SEED aims for these parties to create a sense of community by bringing families of special needs children together in a casual, fun environment. Local sponsors are needed for both in-kind and monetary donations. Donors will be recognized on SEED’s website and social media pages and are also welcome to provide promotional materials at the parties. For more information about how to sponsor, please contact Ember Bailey at: seedlaf@seedlafayette.org. To learn more about SEED and its activities, go to: www.seedlafayette.org. The AUHSD Governing Board is seeking at least two additional community members to join the Measures G & A Citizens' Oversight Committee. The Committee meets twice annually and provides oversight of the use of parcel tax revenue. Measures G and A are parcel taxes of $189 and $112 per parcel, respectively, and bring in almost 14% of total District revenue. Completed applications are due by 4:00 p.m. on Friday, December 7, 2018, through an online submission or hard copy delivery. For more information, click here. Lafayette Chamber of Commerce is proud to support the San Francisco Business Times’ East Bay Book of List Party. The Party – a celebration of East Bay excellence will be on December 13, 2018 at the Roundhouse Conference Center in San Ramon. Use promo code: lafayette for 10% off your ticket! For information or to register, click here. Kennedy Wilson is pleased to host a workshop for landlords interested in leasing to the cannabis industry. We will review the topics critical for successful leasing in this market segment. You will hear representatives from Wendel, Rosen, Black & Dean, Commercial Coverage, Grow Builders, Inc., Stewart Tittle, & the City of Antioch discuss the latest market trends for this emerging market. • Legal - What terms do I need to modify or add to my lease form? • Insurance - How do I insure my building with this use? • Title/Escrow - Can I buy a building to lease to a cannabis tenant? • Tenant Improvements - What type of TI work is required? • Government - What is the process with the City for approvals? RSVP is required to Eric Rehn, CCIM, Vice President, Kennedy Wilson Brokerage Group, (925) 784-3449, erehn@kennedywilson.com. Do you want to learn computer programming? Join us for a one-hour session of programming activity during Computer Science Education Week. Code.org's own tutorials feature Minecraft, Star Wars, Disney's Moana, and more. Monday December 3, 2018: Register here. Tuesday, December 4, 2018: Register here. Thursday, December 5, 2018: Register here.